Their reputation precedes them. Stories of schools of piranha devouring humans and large mammals with such swift ferocity that the water boils around them have been passed around for years. In reality, the stories are urban legend. However, with their razor sharp teeth, streamlined bodies and aggressive instincts, piranha are some of the most efficient predators on Earth. Piranha species are divided into five genera within the subfamily Serrasalminae: Pygocentrus, Serrasalmus, Pristobrycon, Pygopristis and Catoprion. Pygocentrus, also called true piranha, contains three species. Cariba piranha inhabit Venezuela's basins and rivers. According to Piranha-Info, local cattle farmers have dubbed them "capaburro," which means "donkey castrator." Nattereri piranha are found throughout South America and present in shades of gold, silver and black. Piraya piranha are restricted to Brazil's Sao Francisco River. They are distinguished by a tufted adipose fin, a feature not possessed by other piranha species. Serrasalmus contains approximately 22 piranha species. Unlike other piranha, Serrasalmus species are not schooling fish, but typically hunt alone and exist in solitude. The maculatus, commonly called the ruby-red piranha, is one of the most widespread Serrasalmus species, inhabiting the waters of Argentina, Brazil, Guyana, Surinam and Venezuela. Other Serrasalmus species include the brandtii, rhombeus, ruby-throated diamond, Eigenmann's and green tiger piranha. According to Zip Code Zoo, the five species that comprise Pristobrycon are distinguished from other piranha in that they are not monophyletic, meaning they do not possess a single morphological feature that unites them to a common ancestor. 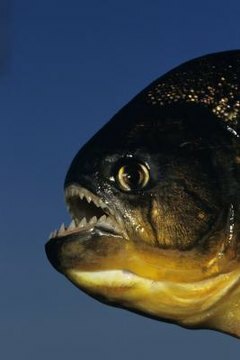 They are rare and less aggressive than typical piranha. Pristobrycon includes the aureus, maculipinnis, calmoni, striolatus and careospinus piranha. The wimple piranha is the lone member of Catoprion. Although historically the wimple has not been considered a real piranha, according to Animal World, recent molecular evidence suggests a close relationship to Pygocentrus species. Wimples are silver with dark spots and possess a very prominent underbite. Small but aggressive, they feed on the scales of other fish with speedy ferocity. Commonly called the five-cusped or big-toothed piranha, denticulata is the only species contained in Pygopristis. It is easily distinguished from other piranha by its crenulated tooth structure. Small and comparatively peaceful, the silvery-blue denticulata possesses a pug nose and a slightly protruding lower jaw. It inhabits the waters of Brazil, Surinam, Guyana, French Guiana and Venezuela.